One of the proudest days of my life was also one of my smelliest. The day I stuffed dead, salted herring into bait bags was the day I became a lobster fisherwoman. Although a few of the locals in the small town of Belfast, Maine tried to warn me away, I was determined to spend a day with a local lobsterman. After all, I had read the best-selling novel, “The Lobster Chronicles” and I was set. “It will be smelly,” they warned. “Do you get seasick? The boat will really roll when you stop to pull up the traps.” The one that perhaps scared me the most – other than the fact that there would be no “head” i.e. bathroom on the boat – was the warning, “Maine lobstermen are a breed of their own. They don’t welcome outsiders.” That got me thinking that perhaps I would be the lobster bait. But nonetheless, I persevered and that is how I ended up in the predawn darkness on a damp, chilly fall morning walking along the dock calling a man named Jim. I had no idea what the guy looked like – I didn’t even know his full name. “Does he have a last name?” asked one fellow already on his boat. “I’m sure he does but I haven’t any idea what it is,” I replied. I’m sure the fact that I was willing to get onto a boat of a perfect stranger whose last name I didn’t even know prompted another to say, “Well, I can be Jim.” Fortunately, it was right about then that the real Jim showed up – with the last name of Kelley. “You coming with me?” he asked and shook my hand introducing himself. So far, so good - he seemed fairly friendly. After showing me to his lobster boat, Kelley and I took off at 5:30 a.m. These lobster folks start off early. We rode 18 miles up the coast from Belfast watching the sun come up with little chatting. His lobster boat was a 26-foot Jonesport built in 1947. When I asked him to spell Jonesport, with his heavy Maine accent Kelley said, “You probably will only understand half of what I say.” He was right and we both laughed. The boat was fairly simple, as was the equipment. There was indeed no head, just a bucket for such purposes. 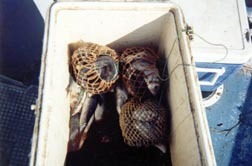 We also had several coolers that contained our bait – the salted herring, and later in the day, our catch, the lobsters. A couple of buckets, life preservers and Kelley’s rubber apron rounded out the equipment. A few buoys that had come loose from traps hung off a hook on the side of the boat. It felt tiny but secure as we went up the coast. “I restored her two years ago but it always needs work,” Kelley said of his boat. The “Jamie Leigh II” was named after one of his five daughters. “She used to work with me and then worked on her own for awhile,” he explained. Although Jamie doesn’t work with Kelley anymore, his 11-year-old yellow Labrador retriever, Chase, often accompanies him. The dog’s photo hung above the wheel on the boat. “He has more schooling than me but he doesn’t listen. He can be quite a nuisance,” he said. At 58, Kelley has been a lobster fisherman for 30 years. “I was a welder before then and did some carpentry as well,” he said. One day he went out with a friend and was “bit.” He has been a lobsterman ever since. According to Kelley most Maine lobstermen start “lobstering” in late may and end usually in early to mid October. “I think they are the best this time of year,” he said. They aren’t really called fishermen but more like harvesters. The Maine lobstermen usually start their day early, like Kelley and I did, and they each have their own route. It is wise to start early in the day, before the winds are too brisk making the waves larger. During the heat of the summer, the lobstermen can get in a lot of work before the sun is too hot. Many go by themselves, again like Kelley. Some days, besides Chase, he would take his neighbor kids to help fill the bait bags. He also took his friend and lobster pound owner, David Carlson, in the early months before Carlson got too busy with his wife Sarah at the pound and working on his new dockside bar. “It cuts down my time,” said Kelley. We rode to the end of Kelley’s route and on the way back, started pulling up the traps marked with his own buoys. 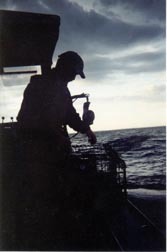 Each lobsterman has his own buoys with numbers as well as tags on each trap. Most now use metal rectangular traps, shaped like giant shoeboxes. Three bricks held in little clamps help weigh down the traps, which settle on the bottom of the ocean. Kelley’s traps were in various places from 25 feet to 75 feet down. When we reached one of his traps, Kelley would reach over the side with his gaff, a stick about three feet long with a hook at the end. He would snag the rope under the buoy, then pull up the rope and hook it on a pulley. 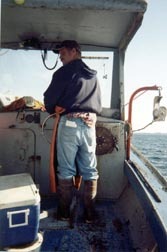 Feeding the rope into a wheel, a motor then pulls up the trap, saving the lobsterman’s back from some of the harder work. “When I first started, I didn’t have one of these,” said Kelley. As the trap neared the top of the water, Kelley would lean over and hoist the trap to the side of the boat. From there, he would open the top and take out any lobsters. Often there would be crabs, starfish, urchins and seaweed as well. On the way to the traps, Kelley said, almost apologetically, “Last week, I didn’t have good bait. I had to use haddock.” Herring, the bait of choice, is getting harder and harder to find. Fortunately, this week, we had herring and Huckleberry Finn -like, Kelley asked me if I wanted to fix the bait bags. Eager to help, I jumped at the chance. The first few traps Kelley pulled up held no lobsters. Again, he seemed to almost apologize. I really didn’t care – just being out on the ocean, participating in the experience was enough for me. When we did get a lobster, Kelley would reach in from behind the lobster’s claws, and then quickly snap a rubber band on each claw with specially designed pliers. My first attempt took me about ten times longer than Kelley. The trap would then be dropped back into the water and off we would go. Soon, we were quite the team, working in quiet camaraderie. I’d “Yippee” when we got a lobster or two in the traps and Kelley would laugh. I was ackward and slow but he didn’t seem to mind and in fact, gave me quite the compliment. “You are speeding me up,” he said. It isn’t an easy life, getting up early, working in the rain and cold, and pulling up trap after trap. Kelley said he had about 350 traps but many have more. There was even one harden lobsterman in his 80’s that still pulled the traps up entirely by hand. Since many lobster alone which can be dangerous if a foot gets caught in the trap rope while the trap if falling to the bottom of the ocean. “Once I was wedged up against the back of the boat when my foot got caught on the rope. I had to cut the rope,” said Kelley. Another local told me that lobstermen always have a knife within reach. As hard as it is though, it is easy how one gets “bit” by this lifestyle. I also learned of the Maine lobstering laws. The lobster has to be between 3 8/32 inches and 5 inches from the rear of the eyeball socket to the rear end of the body shell to be legal to keep. There is actually a little State double gauge lobster measure that the lobstermen use. Female lobsters with eggs need to be put back in as well as those that are notched – all egg laying female lobsters must be V-notched with a gadget that looks like a V-shaped hole punch. The V-notch goes on her right flipper next to the middle flipper. A female with no eggs and no notch is fair game. Maine is of course known for its lobster – even the McDonald’s carries a lobster roll. During my stay I had steamed lobster, fried lobster tail, lazy man’s lobster that is already shelled, lobster salad, and pecan crusted lobster cakes. On my flight home, I brought six lobsters that I then steamed for my family later that night. 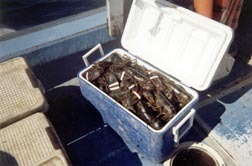 Main lobsters are available year round thanks to lobster pounds where they are housed in large tubs. During our day, we pulled up between 50 to 60 pounds – a whole cooler full - according to Kelley. At the end of our day, Sarah Carlson, David’s wife and co-owner of lb lobster belfast pound, steamed up one of my lobsters so I could eat it right away. Kelley takes his catch to the Carlson’s at the end of each day. One of them will weigh the lobsters and put them in their appropriate tanks. The lobsters are then cooked for sale at their little café or sold to tourists, town’s folks or shipped. I was quite the sight with my baseball cap, herring smeared pants, and smelly water sandals, eating my lobster in a booth outside the pound. As I sat with the butter rolling down my arms and eating the fresh lobster, Kelley said, “I’ll be going out tomorrow if you want to go.” I think I have found a new career. Ganster is a freelance writer based in Gibsonia, Pennsylvania and went lobstering in Belfast, Maine. She is the co-author of “French Cooking…Cooking Aboard the Lewis R. French,” a cookbook about the Lewis R. French, one of the Maine Windjammer Tallships. You can reach her at ganster@connecttime.net or check out here website at www.thetravelingbag.com. 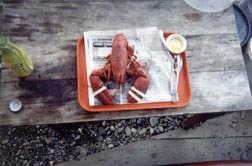 For more information about the Carlson’s restaurant and lb lobster belfast pound check out www.3tides.com. Interested in visiting Waldo County Maine? Call 1-800-870-9934 or www.waldocountymaine.com.